Why is correlation not very useful when one of the variables is categorical? This is a little bit of a gut check, please do help me see if I'm misunderstanding this concept, and in what way. I have a functional understanding of correlation but I'm feeling a little grasping-at-straws to really confidently explain the principles behind that functional understanding. As I understand it, statistical correlation (as opposed to the more general usage of the term) is a way to understand two continuous variables and the way in which they do or do not tend to rise or fall in similar ways. The reason you can't run correlations on, say, one continuous and one categorical variable is because it's not possible to calculate the covariance between the two, since the categorical variable by definition cannot yield a mean, and thus cannot even enter into the first steps of the statistical analysis. Correlation is the standardized covariance, i.e the covariance of $x$ and $y$ divided by the standard deviation of $x$ and $y$. Let me illustrate that. Many statistical calculations are based on this, incl. the correlation coefficient (see below). Now, the covariance assesses whether two variables are related to each other. A positive value indicates that as one variable deviates from the mean, the other variable deviates in the same direction. By standardizing, we express the covariance per unit standard deviation, which is the Pearson correlation coefficient $r$. This allows comparing variables with each other that were measured in different units. 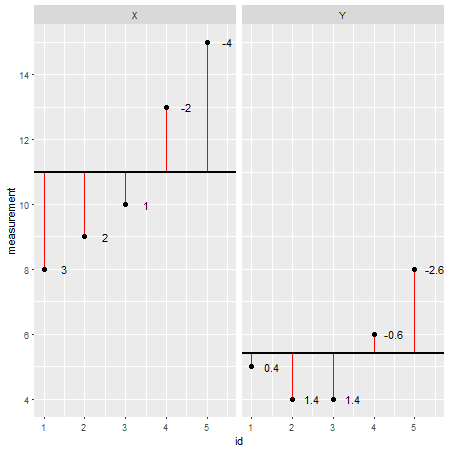 The correlation coefficient is a measure of the strength of a relationship ranging from -1 (a perfect negative correlation) to 0 (no correlation) and +1 (a perfect positive correlation). So long story short, yes your feeling is right but I hope my answer can provide some context. You are (nearly) right. Covariance (and therefore correlation too) can be computed only between numerical variables. That includes continuous variables but also discrete numerical variables. Categorical variables could be used to compute correlation only given a useful numerical code for them, but this is not likely to get a practical advantage - maybe it could be useful for some two levels categorical variables, but other tools are likely to be more suitable. There is absolutely nothing wrong with computing correlations where one of the variables is categorical. A strong positive correlation would imply that turning your categorical variable on (or off depending on your convention) causes an increase in the response. For example this could happen when calculating a logistic regression where variables are categorical: predicting the chance of a heart attack given patient comorbidities like diabetes and bmi. In this case BMI would have would have a very strong correlation with heart attacks. Would you conclude that's not useful? Not the answer you're looking for? Browse other questions tagged correlation categorical-data covariance or ask your own question. Linear regression what does the F statistic, R squared and residual standard error tell us? Does the magnitude of covariance have any real meaning? Why is correlation formula the way it is? Or Say how it formed?